After a promising start to the preseason, Houston Texans linebacker Jadeveon Clowney has missed almost all of his rookie season with various injuries. The main injury was a torn meniscus, which he suffered in Week 1 against the Redskins, supposedly because of Houston’s spotty playing surface. 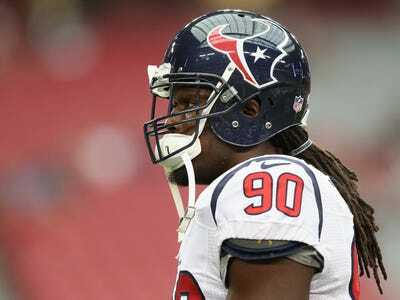 Before Sunday’s game against the Philadelphia Eagles, Clowney got the flu and couldn’t play. A torn meniscus is typically a four-to-six week injury. Clowney missed six weeks. He played about half the team’s snaps in a Week 8 win over Tennessee before sitting out Week 9 with the flu. Clowney also faced criticism about his “commitment” in his last year in college. Pressuring a rookie into playing hurt probably isn’t the best look for Houston, especially when he is considered one of the best prospects in years and you’re paying him $US22.3 million over the next four years.